Have you ever wanted to develop apps for the car, but found the variety of OEMs and proprietary platforms too big of a hurdle? Now with Android Auto, you can target a single platform supported by vehicles coming soon from 28 manufacturers. 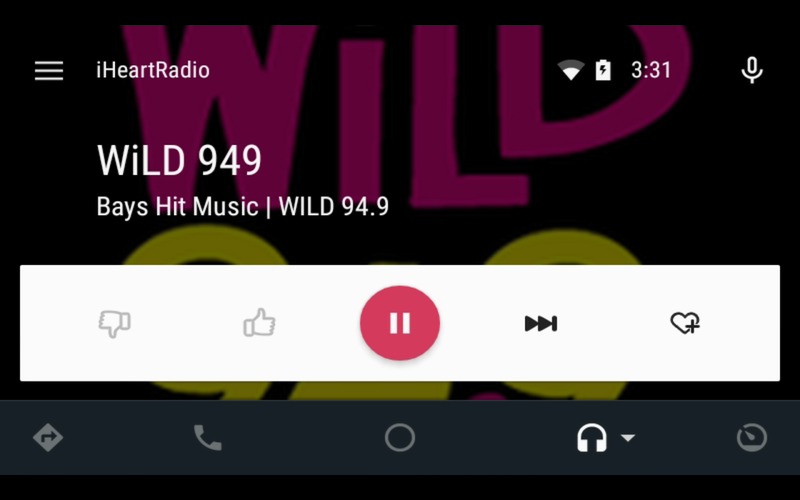 Using familiar Android APIs, you can easily add a great in-car user experience to your existing audio apps, with just a small amount of code. If you’re new to developing for Auto, watch this DevByte for an overview of the APIs, and check out the training docs for an end-to-end tutorial. 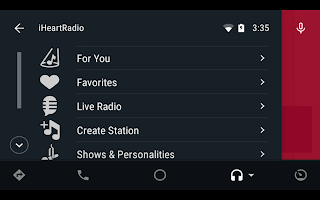 Custom playback controls on NPR One and iHeartRadio. The first thing to understand about developing audio apps on Auto is that you don’t draw your user interface directly. Instead, the framework has two well-defined UIs (one for playback, one for browsing) that are created automatically. This ensures consistent behavior across audio apps for drivers, and frees you from dealing with any car specific functionalities or layouts. Although the layout is predefined, you can customize it with artwork, color themes, and custom controls. Both NPR One and iHeartRadio customize their UI. 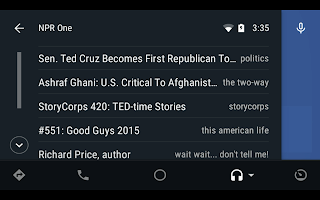 NPR One adds controls to mark a story as interesting, to view a list of upcoming stories, and to skip to the next story. 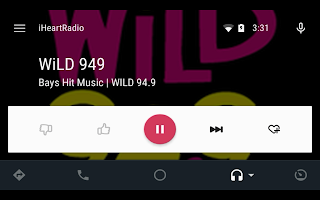 iHeartRadio adds controls to favorite stations and to like songs. Both apps store user preferences across form factors. Because the UI is drawn by the framework, playback commands need to be relayed to your app. This is accomplished with the MediaSession callback, which has methods like onPlay() and onPause(). All car specific functionality is handled behind the scenes. For example, you don’t need to be aware if a command came from the touch screen, the steering wheel buttons, or the user’s voice. Browsing content on NPR One and iHeartRadio. The browsing UI is likewise drawn by the framework. You implement the MediaBrowserService to share your content hierarchy with the framework. A content hierarchy is a collection of MediaItems that are either playable (e.g., a song, audio book, or radio station) or browsable (e.g., a favorites folder). Together, these form a tree used to display a browsable menu of your content. With both apps, recommendations are key. NPR One recommends a short list of in-depth stories that can be selected from the browsing menu. These improve over time based on user feedback. 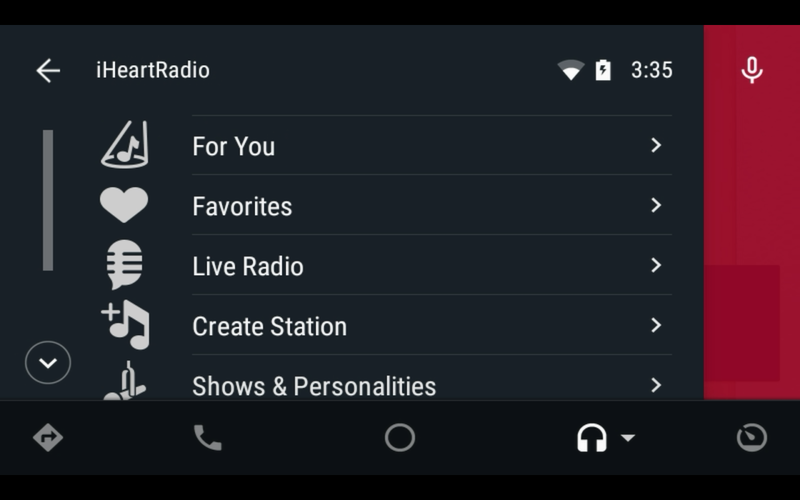 iHeartRadio’s browsing menu lets you pick from favorites and recommended stations, and their “For You” feature gives recommendations based on user location. The app also provides the ability create custom stations, from the browsing menu. Doing so is efficient and requires only three taps (“Create Station” -> “Rock” -> “Foo Fighters”). When developing for the car, it’s important to quickly connect users with content to minimize distractions while driving. 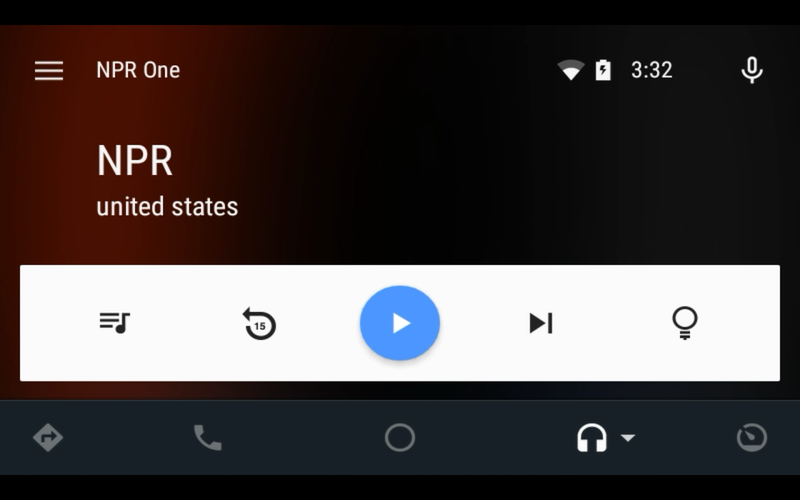 It’s important to note that design considerations on Android Auto are different than on a mobile device. If you imagine a typical media player on a phone, you may picture a browsable menus of “all tracks” or “all artists”. These are not ideal in the car, where the primary focus should be on the road. Both NPR One and iHeartRadio provide good examples of this, because they avoid deep menu hierarchies and lengthy browsable lists. Voice actions (e.g., “Play KQED”) are an important part of Android Auto. You can support voice actions in your app by implementing onPlayFromSearch() in the MediaSession.Callback. Voice actions may also be used to start your app from the home screen (e.g., “Play KQED on iHeartRadio”). To enable this functionality, declare the MEDIA_PLAY_FROM_SEARCH intent filter in your manifest. For an example, see this sample app. 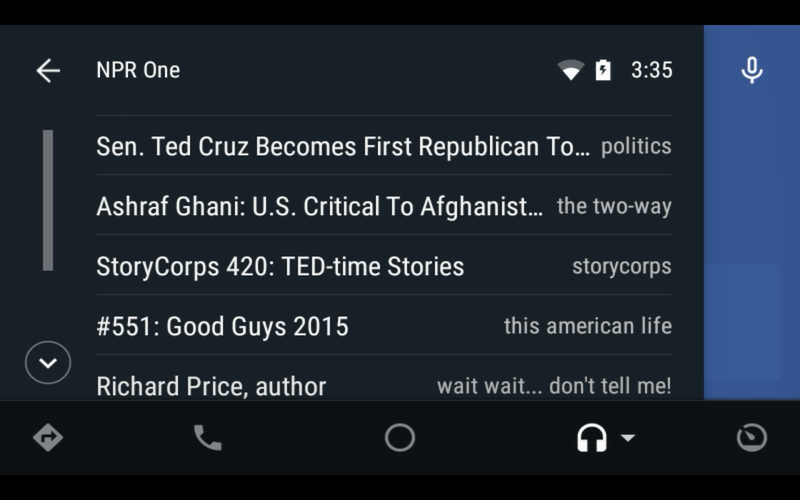 NPR One and iHeartRadio are just two examples of great apps for Android Auto today. They feel like a part of the car, and look and sound great. You can extend your apps to the car today, too, and developing for Auto is easy. The framework handles the car specific functionalities for you, so you’re free to focus on making your app special. Join the discussion at http://g.co/androidautodev if you have questions or ideas to share. To get started on your app, visit developer.android.com/auto.